Can you make a difference if you help just one person per day? You bet! Many of us become involved with efforts to help the environment, cancer research, and numerous other large-scale causes. Those efforts are worthy and important. Some of us help by donating money. Others help by volunteering their time. At the end of the day, most of us feel happy that we were able to help, in a small way, a worthy cause. When it comes to small-scale efforts, most of us are less interested. After all, if I can spend 2 hours helping thousands of people, why should I spend 2 hours helping just one person? It’s a fair question and the answer will differ for most people. As we get ready to start a brand new year, think about how you can help others. 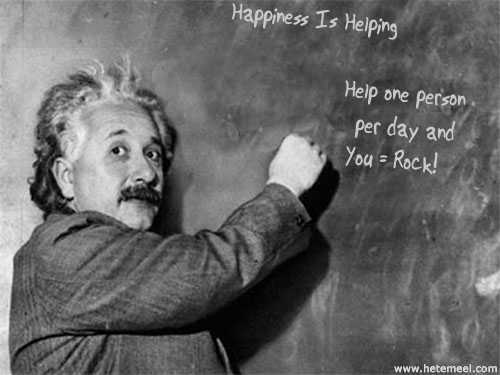 Imagine how much good you can do if you help just one person per day. Imagine how much good THEY would do if they too help one person per day.